This Garlicky Spaghetti Squash with Pumpkin Chicken Meatballs is a deliciously healthy fall or winter meal that is so quick and easy to make! 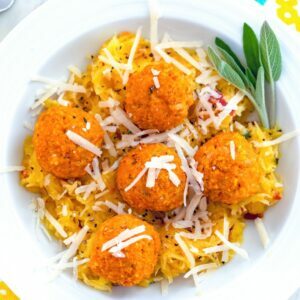 (This recipe for Garlicky Spaghetti Squash with Pumpkin Chicken Meatballs was originally posted in October 2013, but was updated with new photos and content in 2019). I have a major gripe in life. My husband doesn’t like squash. He doesn’t like squash of any kind. Helllooo. This absolutely kills me because in these dark, cold winter months, all I want to do is take advantage of seasonal produce and squash is a major part of that abundance. Also, there are so many different kinds of squash that I just don’t understand how you can harbor a dislike for them all. If you don’t like butternut, maybe you’d like spaghetti? If you don’t like spaghetti, maybe you’d like acorn? But nope, nope, nope. He doesn’t want anything to do with anyone in the squash family. I guess I am evil because I still make it for dinner semi-frequently and cross my fingers that this will be the squash dish to change everything. And it never is. Because I think he just has it in his head that he dislikes squash now and nothing I can do will change his mind. Not even drowning it in garlicky butter and bacon. But that’s OK… I guess that just means more for me. Luckily, he hasn’t quite realized that pumpkin and squash are in the same family (shhh! don’t tell him. also, hi honey; I’m sure you’re reading this and just pretend I didn’t say that!) maybe because in my house, pumpkin mostly comes in a can and I also create all sorts of delicious desserts with it. So, I guess you could say this Garlicky Spaghetti Squash with Pumpkin Chicken Meatballs is kind of like a double squash dinner. Which to me is absolute heaven. And at least my husband will happily eat the meatballs… And will eat enough of the squash to keep me relatively happy. I used to only eat pumpkin from September to November. But then I realized how silly I was being to eliminate such a wonderfully tasty way to add a little extra nutrition to my meals. So, while I will keep the pumpkin spice flavored treats to the fall months, I will eat pumpkin whenever the craving hits. Which quite honestly, is most of the time. Can we talk about how easy spaghetti squash is to prepare? Yes, let’s talk about it. And then let’s talk about how easy these chicken pumpkin meatballs are to prepare. Because I feel like this meal seems a lot more complicated than it is. Really, the most difficult thing about it is waiting for your squash to finish roasting so you can cut it in half and scoop all that delicious flesh out. If you Google “how to cook spaghetti squash,” you’ll get about a million results, each telling you to do something slightly different. With enough experimentation you’ll find your favorite way, but here’s the spaghetti squash roasting method that’s always worked for me. I like this method best because it doesn’t require slicing the squash in half before roasting it, which is always so difficult for me to do. With this method, you roast the squash whole and cut it in half when it’s tender. I use a sharp knife to pierce the spaghetti squash all over and then simply bake the entire squash on a baking sheet at 375 degrees for 70 minutes, rotating the baking sheet after 35 minutes. If it’s tender enough to be pierced with a knife, I remove it from the oven. Otherwise, I roast it for another 10 minutes. Once it’s tender, I slice it in half lengthwise, discard the seeds and then scrape out all that delicious spaghetti squash flesh. Once you have the spaghetti squash flesh out, you’ll sauté it with butter, garlic, sage, and crumbled bacon. Just until it’s nice and tender. I recommend starting the pumpkin chicken meatballs when the spaghetti squash is almost done roasting in the oven. I crave meatballs basically ALL OF THE TIME. They’re so super easy to make and so delicious. Chicken meatballs can tend to be a little boring (but healthy! ), so I decided to add some pumpkin and spices in to make them more exciting. Mission accomplished! And much like the garlicky spaghetti squash, these pumpkin chicken meatballs are ridiculously easy. You really just need to put all the ingredients in a bowl and use your hands to combine and then roll into golf ball sized balls. Place in a baking dish and bake at 375 degrees for 25-30 minutes, until they register internally at 165 degrees on a thermometer. One great thing is that if you overcook these meatballs a bit, they’re still incredibly moist thanks to all that pumpkin. It’s nice to have them a little bit crispy on the outside, too. I served the pumpkin chicken meatballs over a big serving of the garlicky spaghetti squash, with a little extra parmesan sprinkled over the top. Hooray for everything about this meal. Every single thing. I’m not going to lie and tell you spaghetti squash will fool you into thinking you’re eating pasta… Let’s be real here. But it is delicious. And this one was packed with flavor thanks to all that butter, garlic, bacon, and sage. I’ve always been a fan of chicken meatballs, but the addition of pumpkin made them about a trillion times better and a billion times more exciting than regular old chicken meatballs. This is a meal that will definitely make another appearance in my kitchen soon. In fact, I already have another spaghetti squash sitting in my fridge. And lots and lots of pumpkin. Like I mentioned, I’ve only recently allowed pumpkin in my life after November. And I’m so happy I did. Pumpkin and bacon is one of my all-time favorite combinations. 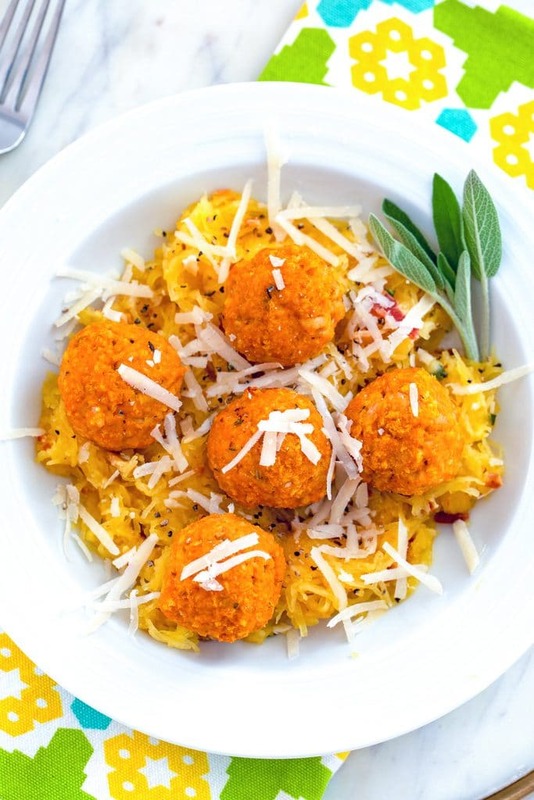 Pssst… this garlicky spaghetti squash with pumpkin chicken meatballs makes for some pretty fantastic leftovers and will make your workday Monday a little bit easier when you know you have this waiting for you for lunch. Do you eat pumpkin outside of the fall months? Some of my other favorite squash dishes include this Chipotle Butternut Squash Soup and this Moroccan Style Stuffed Acorn Squash. I also can’t wait to try this Butternut Squash and Blue Cheese Crostini from SprinkleBakes! Garlicky Spaghetti Squash with Pumpkin Chicken Meatballs is a deliciously healthy fall or winter meal that is so quick and easy to make! Using a sharp knife, pierce spaghetti squash skin in several places. Place squash on a foil-lined baking sheet and bake for about 70-80 minutes, until tender (and can be easily pierced with a knife), rotating the baking sheet after 35 minutes. Remove from oven and let rest until cool enough to touch. Keep oven at 375 degrees for meatballs. Once squash is cool enough to touch, cut it in half lengthwise. Scoop out seeds and either discard or find another use for them. Using a fork, scrape flesh out in strands and place in bowl. In a large skillet over medium heat, melt butter. Cook garlic for about 1 minute. Add squash flesh, sage, and crumbled bacon to pan. Cook mixture for about 3 minutes until nice and tender. If oven was turned off after making squash, pre-heat to 375 degrees. Lightly spray a medium baking dish with oil. 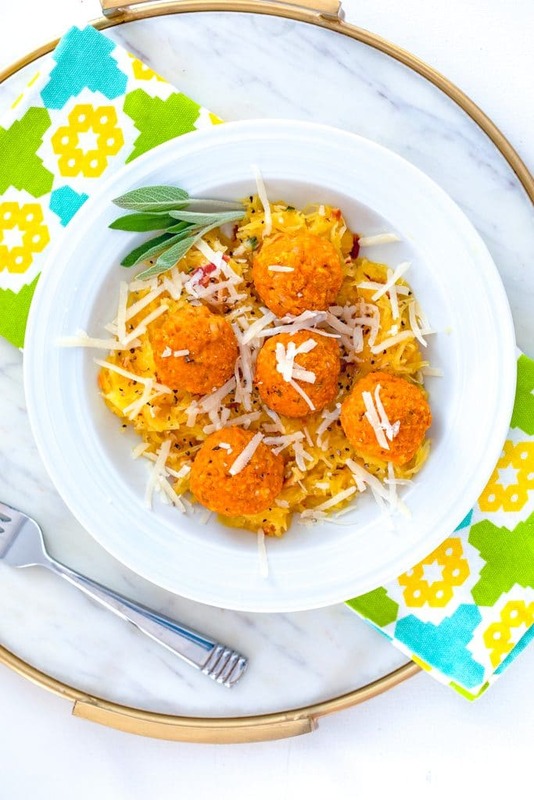 In a large bowl, combine ground chicken, pumpkin puree, thyme, ginger, panko, parmesan cheese, and egg. Mix by hand until fully incorporated. Using your hands, roll mixture into golfball size balls and place in prepared baking dish. I got about 24 meatballs. Bake for 25-30 minutes, until inside of meatballs register at 165 degrees on a thermometer. 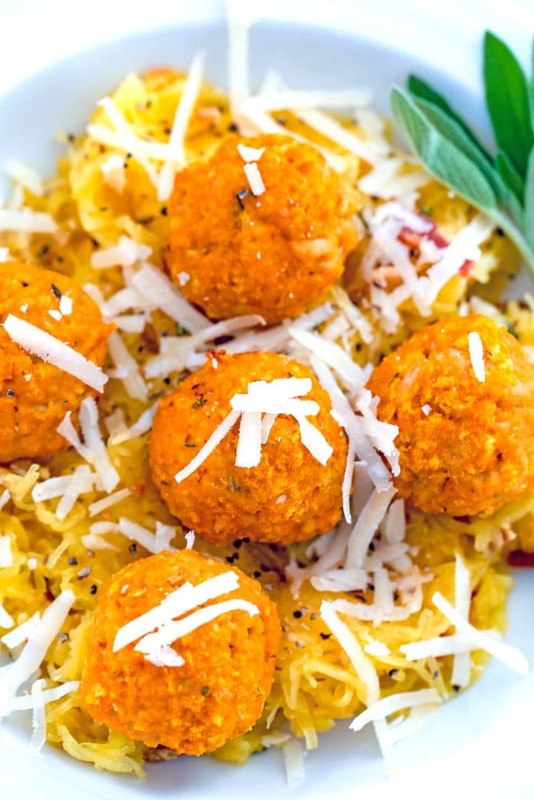 Serve pumpkin chicken meatballs over garlicky spaghetti squash with additional parmesan cheese sprinkled over the top. 24 Responses to "Garlicky Spaghetti Squash with Pumpkin Chicken Meatballs"
I am SO making these meatballs! Love the pumpkin in there. Spaghetti squash is amazing. I had to ease Josh into it as well. what a fun idea! I haven’t had spaghetti squash yet this season- thanks for the reminder! The idea of calming music for cats made me laugh out loud. And the idea of pumpkin chicken meatballs made me very hungry. Looks delicious! I have continued to struggle with spaghetti squash – love the idea of sauteing it after cooking. I will have to try this and see how it works out! 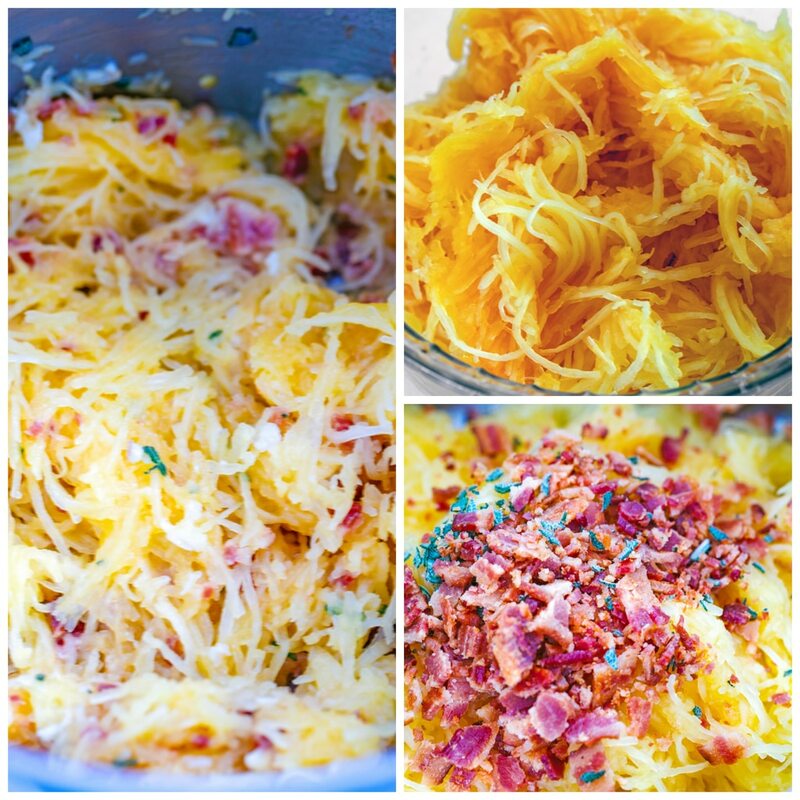 I love spaghetti squash – I always make it the Martha way too! Note to self: Make this. Not only is this gorgeous- its so beautiful. I am still following a paleo regiment and this recipe is at least 85% paleo and I can live with that. I have an aversion to spaghetti squash becuase the last time i ate it, i got noro virus later in the day. The smell of it makes me think of that awful night. lol. I would sub it for zucchini noodles, which, if you have a julienne peeler- are a cinch to make. I would stir fry the zucchini the same way! Cracking up about the music stuff. Poor KC and JoJo! I always forget about spaghetti squash as a sub for noodles. I need to try this recipe to rekindle my love for it. Have you tried the zucchini “noodles” yet? Delish! Calming Music for Cats? That is music gold!! And this meal is fall gold! 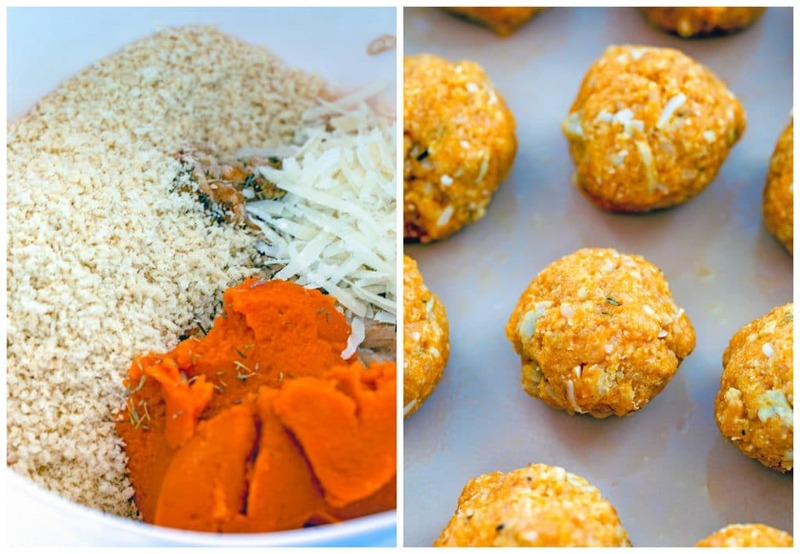 I love the idea of adding pumpkin to meatballs! Adding this to my menu for next week. This looks AWESOME! Super excited to try it : ) Love your recipes! Pumpkin chicken meatballs sound amazing!! This twist on the meatballs sounds so good. I like this idea for fall! Wow! What a combination! I would LOVE to try some of this right now! Genius idea for a perfect fall meal! You crack me up! Calming Music For Cats! At least now you know it’s not for you, right? This dish sounds really great for fall! I love how it’s low starch (even though I LOVE starch) and you technically used two different winter squashes (even if one is canned). Very fun and inventive! What a creative and tasty looking meal! they have a new album out?! I am shocked! I think that was my prom theme back in the day! 🙂 spaghetti squash is a favorite here in our house…will have to add these tasty meatballs! Looks so good! I love spaghetti squash- it still fascinates me to scoop it out of the shell. 🙂 Those meatballs look delicious too, with the pumpkin puree. Must try! my husband will be absolutely terrified by this dish, but i can’t wait to try it! sounds amazing. OMG this was absolutely awesome and SOOOOOOOO easy! Thank you for sharing! Hi. This sounds divine! I was wondering what the calorie count per serving is? I must say its a great combination. I made this spaghetti it is amazing and very delicious.